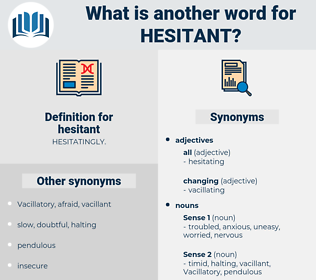 What is another word for hesitant? 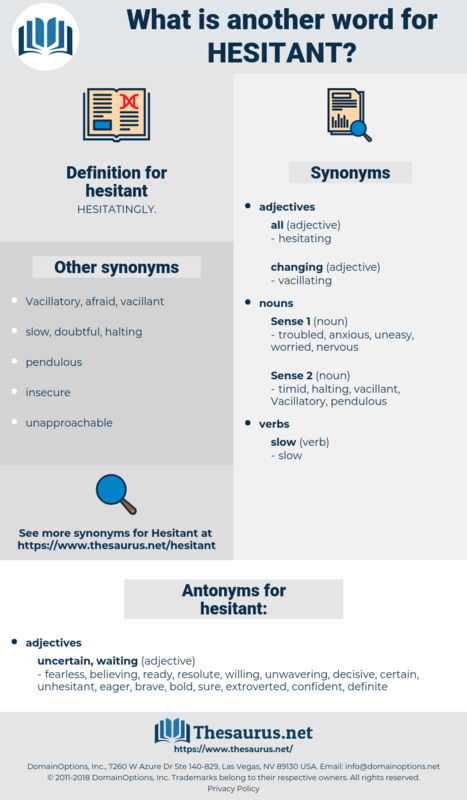 cautious, unwilling, doubtful, Half-hearted, shy, questionable, shaky, restrained, dubious, wary, halting, insecure, resistant, precarious, dilatory, averse, careful, afraid. reticent, tentative, timid, indecisive, sceptical, loath, uncertain, wait-and-see, unsure. fearless, believing, ready, resolute, willing, unwavering, decisive, certain, unhesitant, eager, brave, bold, sure, extroverted, confident, definite. Then she became - quite genuinely - a nervous, hesitant, pale little thing. Karan Singh moved out onto the balcony next to Jadar, hesitant to interrupt his thoughts.